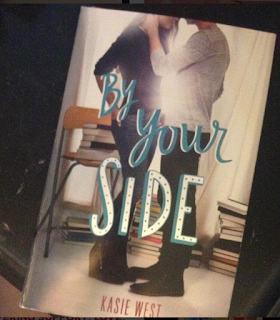 By Your Side By Kasie West is the latest book I decided to read. It is a Young Adult Romance story that's like all basic young adult novels, girl meets guy and then girl eventually falls in love with the guy. So now that I have board you to death, lets begin with the summary of the story. I honestly never know how to start the first paragraph🤔, like should I add more about the book here or should I just jump into the review without an introduction. Okay guys enough about my anxiety lets get to the story, which is why your here for. The main female character’s name is Autumn(btw love this name😉). She ends up at the library for a study group, things go wrong and she some how gets trapped there.After a while, she comes to find out she is not alone in the library, their is a guy there too, dun dun duh( <—this part so much funnier in my head). The guy happens to be none other then Dax Miller, the bad boy at school, or is he really?👦👦 Eventually we find out that Autumn has Anxiety, which leads Dax to finally getting them out of the library, but that doesn’t end their new connection or does it, dun dun duh(again with that strange music, that is not really music since your writing this.😜😜) Okay so I suppose you want to know more now right? But now I can’t really tell you the rest of the story can I? So I guess you will just have to buy it for yourself and find out how it ends, dun dun duh( <--okay for the last time, not as funny as it sounds). As for the book overall, I gave it a 3 out of 5 stars🌟🌟🌟. I so enjoy Kasie West writing style, it flowed so easily together as the story continue. I loved that she wrote a young female, who deals with anxiety but I felt like it was the standard definition psychological text book anxiety. I felt like she was writing the character like a Doctor would talk about a patient. I always have this issue with authors who I feel like are not familiar with true patient feelings on anxiety (Sorry Kasie if I am wrong here). While I could see myself in the bouts of anxiety that Autumn was facing, it just didn’t feel real, if that makes sense. Now that is not to say that I don’t love Kasie's work because I really did enjoy this story. It was a great story about high school, friendships, and relationships between guys and girls. I would so recommend this book to any teenager who loves to read📚. So now onto the cover of the book, I like the cover, its okay. To me it is the modern day typical Young adult novel cover for the American releases, which are usually very common and constantly use covers. As for Kasie west books in general,I will definitely be reading more of her books, simply because her writing style is bloody amazing(oh look the british side is coming out😉). She honestly wrote a thumping good story (again brit bloodline, oh who the heck am I kidding, its my obsession with british tv that clauses these analogies😆). But really this story was such an easy, and fast read, I am sure you will enjoy it and I know your teenager will enjoy it, So go buy it already. As always all information for this book is listed below along with buying and contact information on the book and author. Please be sure to follow and share.